Thanks to The Spice Lab for providing me with a free Gourmet Collection for this review! As I'm sure a lot of you know, I have been dieting for several months now - While I love the food I am eating, sometimes I just like to spice it up a little to get some different flavors, so I was extremely excited to try these amazing, rare salts, which come from all over the world. Apple Wood Cold Smoked Sea Salt from Washington State. Pink Sea Salt from the Murray River. First Harvest Sea Salt from Fleur De Sel France. White Flake Sea Salt from the Island of Cyprus. Hawaiian Red Clay Alaea Sea Salt. To be honest, before I actually tried the salts, I was pretty skeptical. My first thoughts were "It's salt, how different could it taste from regular salt?" Well to my surprise, each had a very unique and distinct taste. I don't think I could pick a favorite, but I tried each salt with different steamed veggies, and it really brought out some amazing flavors in them. I tried a little Cyprus Flake in some broccoli, and it was amazing - Same with the Hawaiian Red Clay Alea Salt on my carrots. One of my favorite things though was the display the salt comes in. Each of the salts are in glass vials (which stand in a block)- So when I was adding salt to my dishes, I felt like a mad scientist - "A dash of this, and a dash of that!" So it was pretty fun actually too - And I have to admit, the salts look really great up on the counter. 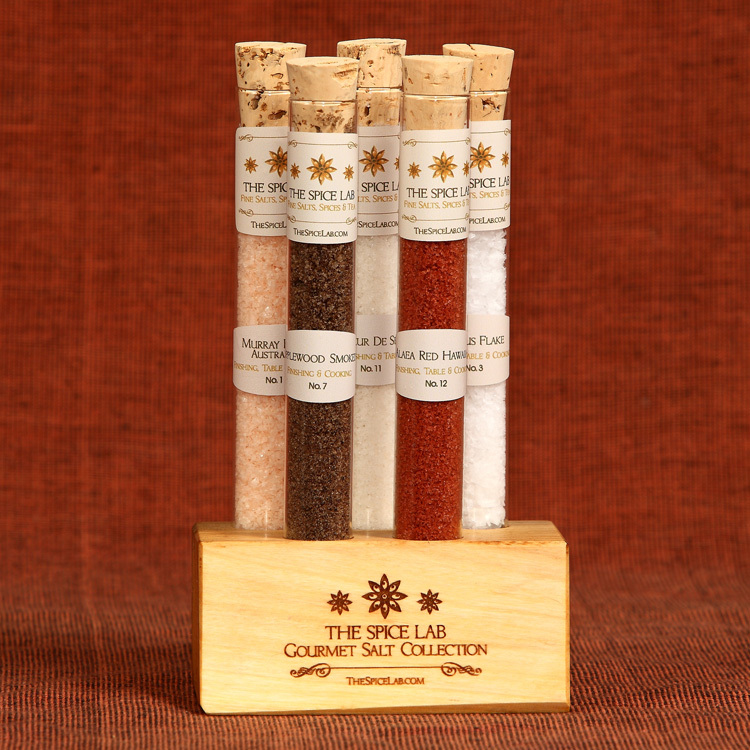 Overall, I absolutely loved my gourmet salt collection from The Spice Lab - It adds new flavors to old dishes, and is truly a treasure to have in your kitchen! Disclosure: Review product was provided to me free of charge. All opinions expressed are my own, and were not influenced in any way. Facebook is not associated with this giveaway. This giveaway will end on June 12th, 2012 at 11:59 pm. Winner will be drawn via Random.org, and winner has 48 hours to respond to my email, before a new winner will have to be chosen. **If Tweeting, you must have an "unlocked" account. Sponsor is responsible for shipping the prize to the winner.This giveaway is open to the US Only. The Bamboo Salt Box looks like it would make a beautiful gift. I would love to try that! I'd like to try Citrus Lime Chili Salt. Really any of the smoked salts. I'd like to try one of the bath salts. I want to try the Afar Salt Pearls "Perfect Pearls"! How awesome! I would love to have a Himalayan Crystal Salt Lamp. I liked the Oprah Aloha Sea Salt Collection! 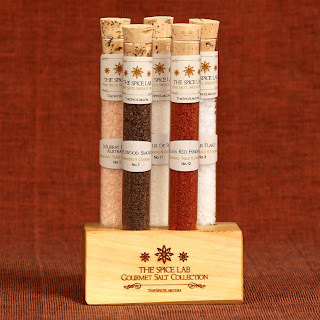 I would love to have the Gourmet Sea Salt Collection! I would love to try the Aloha Sea Salt Tasting Collection 11 Tubes. 4 Inch Himalayan Crystal Salt Bowl. I have never tried gourmet salts so I would like this collection so that I could try them all. Afar Salt Pearls "Petite Pearls"
I'd like to try Premium Citron - Lemon Cyprus Flake Finishing Sea Salt :) *Thanks* for the giveaway!